1. Where do the multiple, firm, mottled blood clots come from? 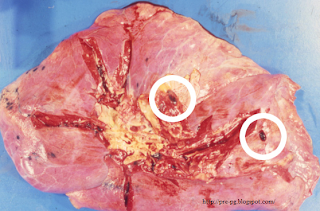 Answer: The multiple firm mottled blood clots are probably emboli. The most common site of origin is from deep venous thrombi in ilieac, femoral, popliteal veins or in the inferior vena cava. 2. The lung has a dual circulation, i.e. pulmonary and bronchial arteries only the pulmonary vessels were obstructed. Why did the parenchyma undergo necrosis? Answer: In the presence ofcongestive heart failure the poor cardiac output reduces the blood supply to the entire arterial system including the bronchial arteries. This additional impairment of blood flow to the lungs, added to the obstruction of pulmonary vessels, may be sufficient to reduce tissue oxygenation below the level of a critical deficiency resulting in tissue necrosis. 3. Characterize those pulmonary emboli that lead to infarction. Answer: Small pulmonary emboli are frequently clinically silent since collateral blood flow and lysis of the thrombi by the fibrinolytic system may prevent ischemia and maintain an adequate supply of oxygen to the lung tissue. Obstruction of even relatively small end-arteries can cause infarction usually in a sub-pleural situation. Obstruction of middle-sized arteries that are not end arteries can cause centrally located hemorrhage without infarction. Obstruction of more than 60% of the pulmonary vasculature can cause acute right heart failure, cardio-vascular collapse and sudden death. 4. Explain the pathogenesis of pulmonary emboli in this case. Answer: Congestive heart failure results in low cardiac output, edema and poor venous return from the legs. Stasis is one of the three major pathogenetic mechanisms leading to thrombosis, as defined in Virchow's Triad. 5. Explain the pathogenesis of the cardiac failure in the patient.